Cruising to or from Boston, your cruise ship will probably dock at Cruiseport Boston in South Boston, not far from the city center and Logan Airport. 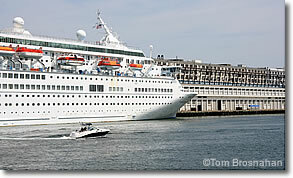 Cruiseport Boston's Black Falcon Cruise Terminal is Boston's main maritime gateway for ocean-going cruise ships visiting the city. Located in South Boston (map), it's connected to the city center and South Station Transportation Center by Silver Line buses. Take Silver Line subway-bus SL2 to reach South Station Transportation Center. From South Station it's a 10-minute, half-mile (800-meter) walk northwest to Boston Common. Or, arriving at South Station on the SL2 bus, you can transfer free the Red Line for Downtown Crossing, Park Street and stations in Cambridge including Kendall/MIT, Harvard and Davis Square/Tufts University. From South Station, Silver Line SL1 subway-bus starts from the same platform as SL2 to go straight to your airline terminal at Boston-Logan International Airport.